Boil rice and drain it. Add some salt while boiling. Finely chop green chillies. Take a bowl. Add cooked rice, curd and mix it. Keep it aside. Make slices of 2 onions. Take kadai and heat oil. Fry onion rings till it turns brown. Take it out and drain it on absorbent paper. Now take oil in kadai(wok) and heat it. Add udal dal, cumin seeds, curry leaves and stir till it turns light brown. Add asafoetida, chopped onions, green chillies and sauté it for about 5-7 minutes till it turns light brown. Add rice curd mix, salt and mix it slowly with spatula so that it doesn’t break. Don’t add too much salt as we have already added salt while boiling rice. 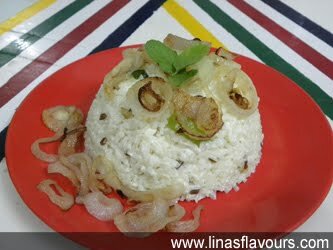 Garnish it with onion rings and coriander leaves. Serve it hot.